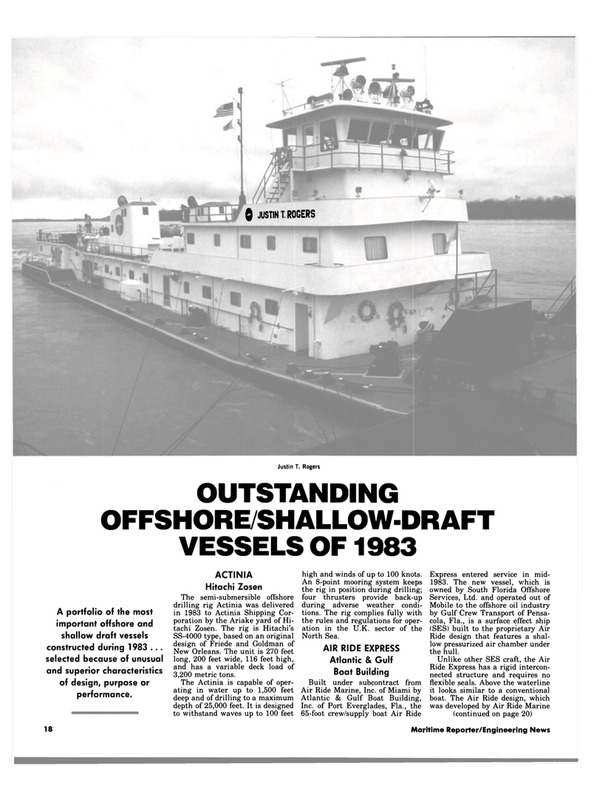 A portfolio of the most important offshore and shallow draft vessels constructed during 1983 ... selected because of unusual and superior characteristics of design, purpose or performance. New Orleans. The unit is 270 feet long, 200 feet wide, 116 feet high, and has a variable deck load of 3,200 metric tons. The Actinia is capable of oper- ating in water up to 1,500 feet deep and of drilling to a maximum depth of 25,000 feet. It is designed to withstand waves up to 100 feet high and winds of up to 100 knots. Ride design that features a shal- low pressurized air chamber under the hull.